The last time Purdue and Nebraska met, point guard Hannah Whitish put on a shooting clinic and paced the Huskers to an 84-64 win on Jan. 31. The veteran guard had 28 points (thanks to six made triples) and 12 assists. She’d been on a bit of a tear of late and the question became whether that would continue. Would Purdue be able to scheme her out in the rematch? Sunday gave the answer, a definitive yes. Whitish took just four shots — all of them 3s — and missed all four. She also turned it over four times in 30 minutes to finish with her first scoreless outing since Nov. 11. And yet, in a 67-61 come-from-behind win for Nebraska (11-13, 6-7 Big Ten), Whitish wasn’t needed. Freshman wing Leigha Brown played the role of unguardable offensive force as she hit Purdue (16-10, 7-6 Big Ten) with a barrage of shots from all over the court. Down the stretch, she was as close to unguardable as a Nebraska player has been this year. Brown hit for just eight points on 3-for-6 shooting in the first half and Nebraska entered the locker room down 28-23. 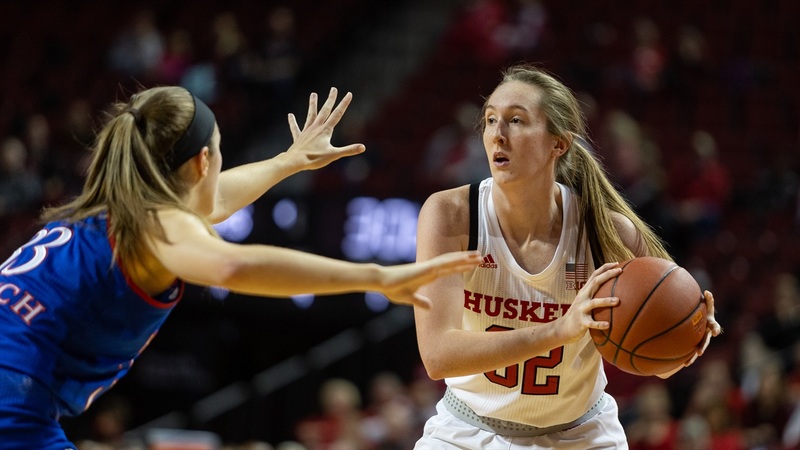 But she caught fire in the third and absolutely took over in the fourth when Nebraska needed buckets, finishing with a career-high 30 points on 8-for-14 shooting from the field, 4-for-6 shooting from 3 and 10-for-12 shooting at the charity stripe. Brown was selective with her shooting from distance, though she was hitting them at a high rate, something you don’t typically see from freshmen. She picked her spots well and attacked when the defense dictated she do so. The made shots wasn’t a career-best but the made free throws were. Nebraska needed every last point. Defense for the Huskers was optional in the first half and no one outside of Brown and guard Nicea Eliely had it from the field on the other end. The two wings went a combined 6-for-10 shooting while the other seven Huskers who saw the court went 3-for-17. Purdue shot 64 percent on the other side during the first quarter. Five quick points from the Boilermakers to start the third quarter put Nebraska in a 10-point hole. The third has been an issue at home this season and looked like it might be again, but an and-one conversion from Brown on a strong take to the rim with 4:40 to play in the frame cut the lead down to five. Two minutes later, Brown pulled up from 3 and splashed one home to bring the Huskers within four. With 49 seconds to play, she drained another. Despite nine from Brown and production from others for the first time all afternoon, Nebraska actually lost ground in the frame and entered the fourth down six, largely because Purdue was still getting what it wanted offensively. Brown forced her way to the free throw line twice in the first 1:12 to open the fourth and knocked down all four shots. But, with 8:30 to play, Nebraska was still down eight. Then, finally, the defense kicked in. Nebraska outscored Purdue 21-7 over the final 8:32 as Purdue missed 13 of its last 15 shots. Center Kate Cain locked down the painted area — Purdue feasted there in the first half with 24 of their 28 points but only had four in the second half and none over the final 8:32. Whitish and Brown helped on the glass, grabbing four boards each, and Brown supplied the offense to keep pushing Nebraska. In eight fourth-quarter minutes, she took eight free throws. With a final margin of six, Nebraska has now played in a program-record 12 two-possession games this season. The Huskers entered the day 2-9 in those games. Finally winning one feels good. Next up for Nebraska is a date with No. 10 Maryland (22-2, 11-2 Big Ten) in College Park, Maryland, on Feb. 14 at 7 p.m. CT. The Terps beat the Huskers 81-63 in Lincoln earlier this season.